TOM SPURGEON: Am I to understand you're sick? SHANNON WATTERS: I think you got me sick over the Internet, because I have joined you on the flu train. SPURGEON: Oh, no. Do you want to reschedule? WATTERS: I don't want you to have to miss any deadlines or anything. I wanted to make sure that because this is a holiday series for you I get to talk to you. [laughs] I woke up and I was like, "Oh, no..." Everybody at work is going down. Yesterday everybody was, "I have a headache" and I was like, "No, no, this is not happening." SPURGEON: That may be a place for us to start. I've not interviewed a lot of folks from BOOM! I don't even know your physical set-up. It sounds like there's a central office where everyone goes to work. WATTERS: [laughs] Yeah. I think that makes us a little different than a lot of publishers our size. We have an office. Mid-city Los Angeles. We have a bullpen: the more senior editors have their own offices and the rest of the gang are out in these open desk areas. We're all in the office together. It really is a great experience, because you're having a problem with a title, or you're having a problem with some sort of plot thing you can literally say, "Okay, we're going to work this out. Everybody get in here." SPURGEON: So how many people are in the office, then? SPURGEON: That was right in the middle of Comic-Con, as I recall. Literally. WATTERS: We moved offices during Comic-Con, while Ross was having a baby. It was crazy. It was a crazy couple of weeks. The office was kind of half-full for a while because of the timing, but we managed to do it. We have a great office. Everybody comes to work. SPURGEON: The idea for doing an interview with a BOOM! editor came from that time. I was the guy standing behind your group in the line at the Amtrak Station, on the way to Comic-Con from LA. I took it from watching you guys that it's mostly young people working there. WATTERS: We're a very young company. The oldest person is Ross, essentially, and he just turned 40. The rest of us, the more senior members of the staff, are in their late 20s and early 30s. The rest of it is a very, very young company. SPURGEON: Do you think that's a positive? WATTERS: Oh, yeah. I think it is. A lot of us have grown with the company. I was a copy editor at Tokyopop just about right out of school, within a few months of graduating from college. That taught me the nuts and bolts of how to edit comic books. My real editing experience came in that I was Matt [Gagnon's] assistant editor for a while. I was on Incorruptible and Elric and all that. Because I got into it in my mid-20s, when I was young, I was moulded by the vibe and ideals of the company. We really are a very, very, tight-knit group of folks. Matt and Ross were in North Carolina at a restaurant, a barbecue restaurant, and on the wall was the code of the west. Matt saw that and was just entranced. "That's BOOM! Right there! Code of the west!" Stuff like "Always watch your partner's back." I think it's been, for a lot of us, coming in young and growing with the company, I think it's been good. Obviously we don't have the pressures and prejudices of being in the industry for a really long time. The company has grown with us and we have grown with the company. I think it's reflected in our ability to move quickly and readjust quickly. SPURGEON: Is there something specific that comes to mind when you say you had to readjust quickly? Is there a time you had to readjust? WATTERS: A few years ago, when Disney kind of took their licenses back, we were getting a lot of calls from friends and contacts within the industry... who were obviously worried about us, and worried about us as a company. That had been such a huge deal, and it was a huge game-changer for us as a company. It was one of those things where you had your mom calling and going, "Oh, honey..." [Spurgeon laughs] "Is everything going to be okay?" And I'm like, "It's going to be okay." We had so many people in the company that were open to different things. Peanuts didn't happen overnight for us. It was one of those things where people were like, "Okay: what's cool? What's interesting? What can we do? We are good at this, so what can we do so that we can continue to be good at this?" A different way. There's this perception that once a company has defined itself, they can't do that again. We like to challenge that. The guiding principle at BOOM! is to just do good work. Everything else is details. SPURGEON: Is there a certain way you define good work? Can you tell a BOOM! book from other books? Do you think readers can? WATTERS: That's an interesting question. Because we are so... diverse in our publishing, it's not the same as seeing a Marvel book or a DC book, where you know this is a certain kind of a book and a certain kind of superhero. But I think that we, especially with the Ka-BOOM! titles -- and Ka-BOOM! is my wheelhouse these days, so I can speak to that -- that we're trying to cultivate this kind of artsy cool, this high quality that you maybe haven't necessarily seen a thousand times before. I think it's that way across all of BOOM! titles. We take our work very, very seriously. We do a lot of licensed books, but we don't look at these books like, "Okay, how do we do this licensed book and get it out?" We all think very, very, very seriously about how to do the best Planet Of The Apes book we can. With Adventure Time, it was a vision. It was, "Okay, we have the best writer for this project. We're going to do this thing that not a lot of licensed comics do, and do it right." [laughs] As far as what defines good work is always being straight-forward and upfront and providing the best quality we can with the resources we have available. SPURGEON: You indicated that Ka-BOOM! is your baby, that that is your particular wheelhouse at the company and it seems like your comics cv kind of confirms that: that's where most of the titles you're crediting for editing are located. Is it correct for me to think that you've been involved with that particular imprint from the beginning? WATTERS: Yeah. When I'd only been at the company for a year, they asked me what I wanted to do, what my vision was for what I wanted to do at BOOM! That's another thing that Matt and Bryce [Carlson] are great at, pairing editors with the project that they're best for. I basically said, "I want to do all-age stuff. I really want to do all-ages stuff. I have ideas that are bigger than the conventional model. That's where my passions lies." I was on a panel at San Diego, the progressive politics panel, they asked "Who do you make comics for?" Everybody had awesome answers, mostly that they really wanted to make comics for everybody. They came to me, and I was, "When I close my eyes, I see a 13-year-old girl, just getting into comics, and finding one of mine and then going out and getting everything else." You know? I took that as I really wanted to make all-ages comics. That made sense to me, that there was this huge group of people that weren't necessarily being published in the mainstream comics world, that they would be perfect for this. SPURGEON: Is there a specific sensibility you're looking for, though? It seems to me that, and maybe that's the nature of the Adventure Time material, that you have a pretty broad range of approaches within this overriding tone. WATTERS: It's interesting. If you've ever read any interview with Pen about what Adventure Time is, he talks about it being a Dungeons and Dragons game. And in a way it is perfect for that kind of sensibility, it's very collaborative. It's not like when you talk to people working on Gravity Falls, which is another amazing kids show on the Disney Channel. That's a show that I love a lot, but Gravity Falls is a show that's very creator-driven in that the creator still does a lot of it, including the scripting, in this very controlled atmosphere. Adventure Time is more about Pen being able to bring in great, creative, interesting people and letting them do what they do, letting them create this world. That's the sense I wanted to get in the comics as well. You pair people with projects based on their strengths. 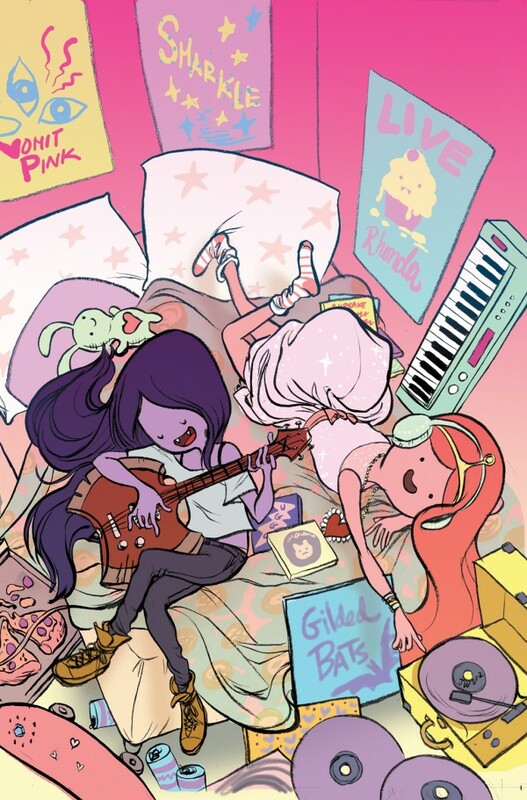 Adventure Time is interesting because almost anyone can play there and do well. As long as you play by the rules, you can do something really, really cool with it. I tend to hire people I really like and admire and let them do basically whatever they want. Within reason. It makes my job as an editor easier. [laughter] But also really cool stuff comes out of that. As far as the sensibility of it a little bit, it's my space and it's Adam's space. People that we like and respect, and a lot of people tend to exist in that same sphere as Adventure Time. SPURGEON: Is there a hire that you're specifically proud of, that you think someone else might not have gone for? I know you probably love them all. WATTERS: Ryan and Shelli and Braden, honestly. Shelli [Paroline] and Braden [Lamb] and I -- Shelli did work on Muppet Snow White. We had worked with them off and on. My girlfriend and I took them out for breakfast one morning, and we were flipping through these sketchbooks, and they were so good. They were so, so good. They were additive -- it wasn't just mastering a pose and getting ready to draw it. They were bringing something to the table. Braden was working as a colorist and it was like, "Why isn't someone giving you the chance to draw? You're incredible." I put them on Ice Age and they did a great job. Ice Age was a test for them, for Adventure Time. Ryan was more of an obvious choice. When I found out I was editing Adventure Time, I went basically, "I want Ryan North to write." His sense of humor is incredible. I've been reading Dinosaur Comics since forever. In college I had a radio show and I would use Dinosaur Comics lines to introduce different segment. Ryan, Shelli and Braden were kind of inspired choices. I look back on it now and I can't imagine doing the book with anybody else. Ryan gets it so naturally... his scripts come in and they're flawless. They're beautifully structured and incredible. Then Braden and Shelli get them, and they add things. They add gags. They add interesting asides. It is incredible how they're perfect for each other, the three of them. I can't imagine the book without them. I lucked out. I lucked out. SPURGEON: It does seem correct that you're using a lot of people that don't have similar opportunities elsewhere, at least not with this kind of project. That brings to mind how conservative comics can be. There's not a lot of market deviation. This one has worked, at least in the face of that general culture, or maybe even because of that. Were there worries on your part that the book might not get a chance, might not find a foothold? WATTERS: Oh, absolutely. [laughs] When we were putting together the creative team for this book, it was kind of a "trust us" situation. "This is going to be great; trust us." Even then the numbers we were estimating were very, very conservative. We were like, "Well... hopefully people will like this crazy thing we're doing with this book." Because you're right. You never know what's going to take in the market these days. It was a comic that we wanted to see, really. This was the best way we could do an AT comic, the best way we could take that show and get across the vibe of the show and make it right for comics. You don't want to do a comic where someone comes in with their eyes closed and says, "Well, we're going to put together a comic based on the TV show." Uh -- who wants to read that? That's not fun. I love that comics has this incredible power over people. If you make a licensed comic you want it to have a reason to exist. That's the guiding principle for me: make the comics you want the make and do it the best way you can. Sometimes it hits, and sometimes you're just happy to go, "Whew, we didn't fall on our face with that one?" SPURGEON: Do you have an editorial style? Are there concerns you have that are important to you when you're working with the pages themselves? SPURGEON: Putting your teams together and the importance of that. You're still a smaller publisher, and you're working with people that have projects of their own that they might prioritize. Is it hard, ever, from that standpoint of simply getting people on board? WATTERS: I have been very lucky in that regard, but I tend not to come at people with unreasonable requests. When I came to Meredith [Gran] to write [Marceline And The] Scream Queens, I told Meredith, "I want you to write this series based on an idea that this other BOOM! editor and I have: a rock-and-roll journey of self-discovery. I want you to write it." Now I'm thinking along the lines of what you just said, Meredith has Octopus Pie. That's her bread and butter. That's the most important thing she can be working on. That's going to be there when these six issues are done. She came back to me and said, "I'd love to write it. Can I draw it, too?" "Why yes, I would love for you to do that." I tend to approach people... if it's someone like Natasha Allegri, who is just incredibly talented and incredibly busy, someone we approached when Adventure Time was getting off the ground and she was terribly busy. There was no way. I didn't even consider her for Fionna & Cake. I saw Pen at Comic-Con and chatted for a bit. I got an e-mail a couple of weeks after Comic-Con. "Hey, great seeing you. Nat wants a chance to audition for Fionna & Cake. Would that be okay?" I'm like, "Umm... yeah." [Spurgeon laughs] "She can have it if she wants it; she doesn't have to try out." If I think someone is going to be way too busy, I don't want to overload their plate. If they can give me more, awesome. Great. If they can't give me anything, that's awesome. We all like to think of our work as the most important work, anybody who's doing anything anywhere, but the people I work with their personal projects are where it's at for them. That's the stuff that brought me to them and that's the stuff that's going to be there when they're done with me. I totally understand if they have commitments to those projects that make their commitments to me harder. I try to work around that. If they have those commitments that need to be met, then we structure the schedule so they have a month and a half per issue instead of a month. It really is... it's a working-together kind of a thing. I want to make sure everybody gets what they need from this relationship. SPURGEON: That's an interesting way to put it, because there's a line of thinking about editors at comics companies where you're the freelancer's friend at the company. That can be used as a criticism, or as a way to dismiss what editors do, but I think that's an underrated skill. You have to be able to get along with people to do what you do, particularly at the level you're doing it. Is that natural for you, to have that friendly way of acting with people. SPURGEON: Do you like working with artists? Not everyone does. WATTERS: Oh, yes. That's the best part. That's the best part, working with these people. I love that. Honestly, I tend to be a fairly open, gregarious person. My girlfriend is very, very quiet, and she talks about that she only dates so she never has to talk to anybody in restaurants ever again. I tend to by nature to be fairly friendly and fairly open. And I am a problem-solver. If I were doing a job interview, and they asked me, "What is your greatest skill?" I would probably say I just get things done. I want people to have... this is a fun thing. This is a really cool thing to be able to work on, obviously it's going to be stressful, because it's work. But I don't want anybody walking away from this project and feel like they were taken for a ride by the schedule or any aspect of working on it. I like working with artists, and I like figuring out ways that we can make the experience good for both sides. And maybe that does have something to do with my personality and the way that I do things. So maybe that is... I love working with artists. I'm really lucky to get to do this. SPURGEON: How much is on your plate? How big of a workload do you have? WATTERS: A lot. Lately? A lot. Let me figure this out. Recently I've had a lot more. My assistant editor left for other opportunities. I have a new assistant editor, just over from Archaia, who is going to be great. But the last two months has been a real wild ride. My workload is pretty intense. 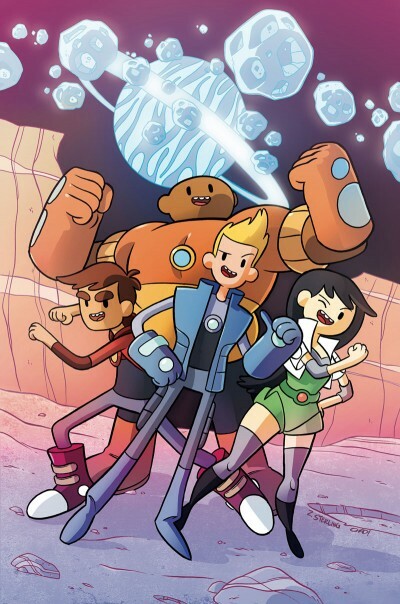 I have Peanuts, and then developing new series, and then Adventure Time, and Fiona And Cake, and then Bravest Warriors, and we have some really big-ticket Adventure Time projects. It gets more intense all the time. I'm a little control freak-y, I think. I have this new assistant editor and I'm afraid to stop doing everything. Ross says I need to sit back and give some stuff away, let other people help you. I've got... so I do an issue of month for each of the series, and then the trade collections that come out, so there's that. Then there is the new Ka-Boom! material for 2013. In 2012 there as also finishing out Incorruptible, Irredeemable and Elric. There was a point for a while, only a month or two, where I was doing seven series. We're all at BOOM! for a reason. SPURGEON: When did the trigger go off for you, that comics might be something you could do professionally and not just follow as a reader or even pursue creatively? When did having a job in comics become a reality for you? Is that something you were always headed to? WATTERS: I went to Occidental College and I was an English major there. I was always an editor. I was editor and chief of my middle school yearbook, editor-in-chief of high school yearbook three out of four years and editor-in-chief of my college yearbook for two out of my four years. So I've kind of always been an editor. It's always been this thing I've been good at. I've been good at reading things. I've always been an editor. My love has always been animation and comics. That's really been where my bread gets buttered for my whole life. I knew that I wanted to do something in that sphere. But, you know, I can't draw. You can be animator, and you can't really do comics. I was lucky in college because they introduced a creative writing emphasis at Oxy for English majors. It was kind of like a minor. You took a set amount of classes, and some independent studies, and you structured them in a way that it focused on whatever writing style, whatever genre you wanted to specialize in and study. I chose comics. I had an advisor, who kind of became my mentor at Oxy, who was very intrigued by comics. He was very interested in pop culture as art and intrigued by comics. He allowed me to study comics, narrative structure and panel structure, for two years along with my English degree stuff. So I came out of college with a really good foundation for being a comic book editor. But I didn't know that's what I wanted to do. I knew that comic book editors were there, and God, wouldn't that be great? Jamie Rich brought his taste to Oni, and his period of Oni defined me as a comic book fan. What a power. What an incredible gift to be able to have, incredible opportunity. So I got a job right out of school as a content manager at a great e-commerce consulting company. Really nice people. I was awful. I hated it. God, I was awful. Terrible. I've never been worse at anything, except maybe French. [Spurgeon laughs] So every day before work I'd spend an hour on Craigslist and every day after work I'd spend an hour on Craigslist. And one day there was a listing for a copy editor position at Tokyopop. And I wanted that. I spent three hours on a cover letter. My good friend was at the time in HR at Google. She read my resume and tweaked it for perfect resume structure. If anybody knows perfect resume structure, it's HR at Google. She tweaked it and sent it in. I got a phone interview! I did the phone interview, and I got an in-person interview! I stood outside pacing because I wanted it so bad. There were like three interviews. For copy-editor, that was a pretty rigorous series of tests. We had to do an editing test. I passed, I guess. I got a job there. I worked there about eight months. That was the first time I thought it could be something. SPURGEON: Do you still retain any of that experience? WATTERS: At Tokyopop? Oh, yeah. The great thing is that we would come in and there was a big rack full of proofs. We would proof all day. When you first start you make dumb mistakes, you skip over things. I wrote a document called "How to be the best damn copy-editor" and when I made a mistake I would add to it and not do that anymore. What that experience did was that it made me very... I don't know if I was detail-oriented the way I am now before Tokyopop. It made certain things second-nature, certain things you'd look for on the page you'd just see them immediately. That has really stuck with me. That skill has been invaluable. You become a comic-book editing machine. I worked with some amazing people at Tokyopop. Tim Beedle and Paul Morrissey who worked for Archaia a long time, they were my guys; Paul helped me get my job at BOOM! by recommending me for the assistant editor's position when he was working on the Disney books years and years ago at BOOM!. Hope Donovan works at Viz now. She's an amazing editor. It was great to be in an atmosphere where you were editing comics. It was a very different experience than with monthly comics. You weren't necessarily creating the way that you are at BOOM! You're not choosing teams, or tweaking scripts. You're taking content that's already produced and making it shine. It was great just being part of that team. And it really showed me it could be your career. SPURGEON: You have to remind me before we get too much further along: is Peanuts one of yours? I know you were involved at the beginning, at least. WATTERS: I was involved at the beginning. Adam Staffaroni and Matt kind of took the reigns on the series throughout most of it. When Adam left, Matt asked me to take it over. I worked on it back when we were selling the Blanket trade near the beginning. At the time I was too overwhelmed to take on another series. SPURGEON: You mention that you were a big strip fan. SPURGEON: So you had to know there would be at least some pushback on the idea of that project. SPURGEON: Is that ever a worry, how the project might be seen in that kind of way? With Peanuts, or with licensed projects more generally? WATTERS: You always want people to like what you're doing with the characters. With Peanuts I think it would be more of a worry if the people that were working on it weren't working on it. 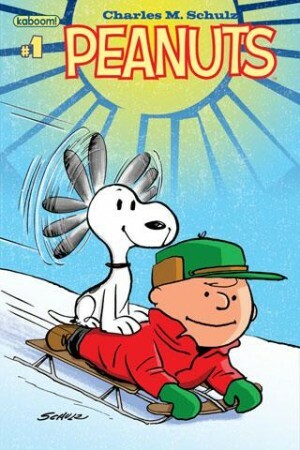 Paige Braddock is obviously an incredibly talented cartoonist on her own but she was also Charles Schulz' assistant for years. They were very close. Paige is basically creative director at Creative Associates. She oversees everything. Paige and Lex [Fajardo] are the most passionate people on the planet about Peanuts. The awe and reverence in their voice still about Peanuts, after working on it for so long, is incredible. I think I would be more worried about it if it wasn't Paige and Lex and the Creative Associates team working on it. They approach it with the utmost love and respect. SPURGEON: Is there any impulse on your part to work more directly with cartoonists' own projects as opposed to licensed products? WATTERS: The nice thing about the licensed products is that they pay the bills. I would love to take somebody's original project and take it through to the end. Hopefully that opportunity comes up at BOOM! or elsewhere to do that. I think that will happen someday, at BOOM! or elsewhere. There are ideas in the works for me to do that. If anything keeps me in it for life, it will be that opportunity. SPURGEON: Are you a lifer? Do you think you'll stick around? WATTERS: Golly, who knows? The dream was always that I get to make all these comics forever. [laughter] That's the dream. I love my job, and I seem to be okay at it. I would love the opportunity to keep doing it. And who knows what life will bring, where life will take you? SPURGEON: That doesn't sound like the most ringing endorsement, Shannon. Is there something that specifically worries you? Do you wonder after the viability of comics long-term? WATTERS: I worry about the sustainability of doing what I do with a family. WATTERS: I grew up in the woods. That's the first thing you gotta understand about me. I grew up in Oak Creek Canyon in Arizona, in the Ponderosa Pine Forest, on a piece of property that's been in my family since the early 1940s. My family is there, and the first 18 years of my life was running around the woods and keeping myself busy. I don't know that I'm suited to be a city girl for the rest of my life. [laughs] You get a little stir crazy in the city. I've been here a little over a decade, I guess. For about a decade. I love LA. I love LA. But I'm afraid my place in comics -- unlike a lot of the amazing artists I get to work with, they get to write and draw for as long as they please. Wherever they are. There are very limited options when you're an editor, as far as moving around. Especially the kind of editing we do which is full-bullpen editing, very collaborative. This kind of atmosphere. I really value that atmosphere, but at the same time, there's only a few places you can do that kind of thing. I would love to keep doing it. I think it's the only thing I've been primed for my whole life. 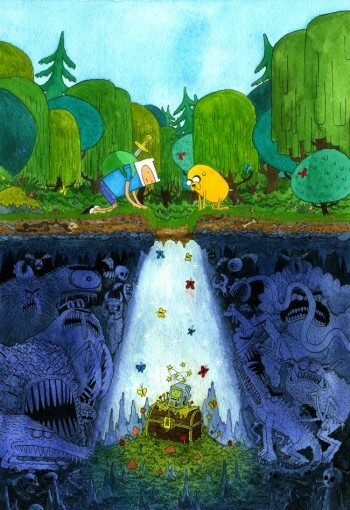 * Adventure Time Search At BOOM!